TICKETS TO THE 2017 KING OF THE WING FESTIVAL ARE SOLD OUT! No tickets will be available at the door. 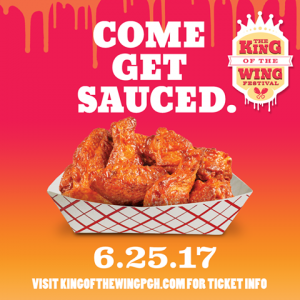 Come get sauced at the the 3rd Annual King of the Wing Festival on Sunday, June 25, 2017 at Penn Brewery (outdoors). Try the best chicken wings from 20 local restaurants with plenty of Penn Brewery brews and live music to wash ‘em all down. Our panel of judges will rate the wings in 4 separate categories before crowning the official King of the Wing. VIP Ticket - Consider yourself a professional wing eater! Beat the line and get first access to the wings with the VIP ticket. 3 hour session of all you can eat wings from 20 of Pittsburgh's best wing slingin restaurants, live music and entertainment. General Admission ticket gets you in the door, 2 hour session of all you can eat wings from 20 of Pittsburgh's best wing slingin restaurants, live music and entertainment. *Under 21 permitted with legal guardian only (KIDS 10 AND UNDER DO NOT REQUIRE A TICKET). Must be 21 and older to consume alcohol at this event. Valid ID Required. Alcohol is not included in the ticket price. *Wings available on a first come first serve basis while supplies last. Wings are NOT available to-go. *There is no on site parking. We recommend street parking or public transportation. *Venue subject to change. Event will go on rain or shine!